I love the cheeky faces of Violas and this striking tapestry is no exception. A fabulous mixture of purples and magenta, will ensure that this little face won’t go unnoticed. 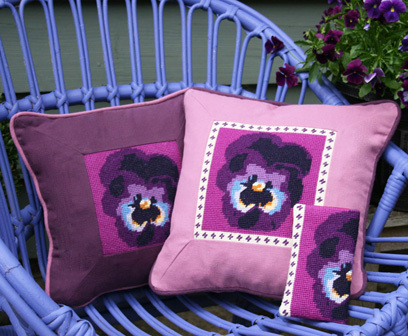 Viola can be made up as a Glasses Case (leave out the top and bottom borders) or as a Cushion as shown here in two ways with mitred fabric borders.